Last year we spent New Years Eve with Christy and Vegar in Amsterdam. This year was a complete 180 from the chaos and commotion, as we spent the holiday in Gouda with the Amelinks. We first went to Arjen’s Uncle’s house and ate homemade Olieballen (round Dutch doughnuts with raisins), which he makes every year. He also made appleflap, which is a sliced apple ring dipped in batter and fried, also topped with powdered sugar. Both were delicious. They introduced us to a game called Shouffe, which is a traditional game the Dutch play around the holidays. It is sort of a table shuffle board, where you slide wooden disks down a board that has four slots at the end, each ranging from 1-4 points. You try to get as many disks into the slots as possible. They get really into it, and are very competitive with their scores. Back at Arjen and Linda’s house, we ate a small dinner with the kids, and then snacked on finger foods the rest of the evening. They usually do this instead of eating a big meal. Just before midnight, we watched the TV program from the fireworks display in Rotterdam, and got our champagne glasses ready. At midnight, you typically have a toast, then kiss your loved ones, and give the three kisses and a hug to your family and friends. Afterwards, everyone moves outside to the streets or parking lots with their little own fireworks (some big, some small). All of the neighbors are also out, and everyone shakes hands or kisses/hugs each other exchanging Best Wishes (Beste Wensen) or Happy New Year (Gelukkig NieuwJaar). The fireworks woke up Thomas and Lukas, and they watched them from the window, bundled up in a blanket. 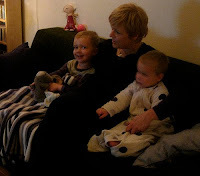 When we came back inside, they were sitting on the couch in their footed PJ’s watching a cartoon. You could tell both were very sleepy, but happy to be up past the usual bedtime. They soon went back to sleep, and so did we. We slept in their attic bedroom, which was nice and cool, dark, quiet. The next morning we had some breakfast and then went outside to play with the kids. Thomas showed us how to ride his bike. It was a big deal that he had learned how to ride without training wheels. He is under 4 years old! They really start them young in Holland. We also engaged in an exhilerating game of memory... of which Thomas won every hand (not humbly). ;) Lukas also showed us his top knotch skills of crayon rolling on the dining table, proclaming each time "rrrrolla!" After a light lunch, we headed back home for an afternoon (and weekend) of relaxing and laziness.